NASA has selected Gale crater as the landing site for the Mars Science Laboratory mission. 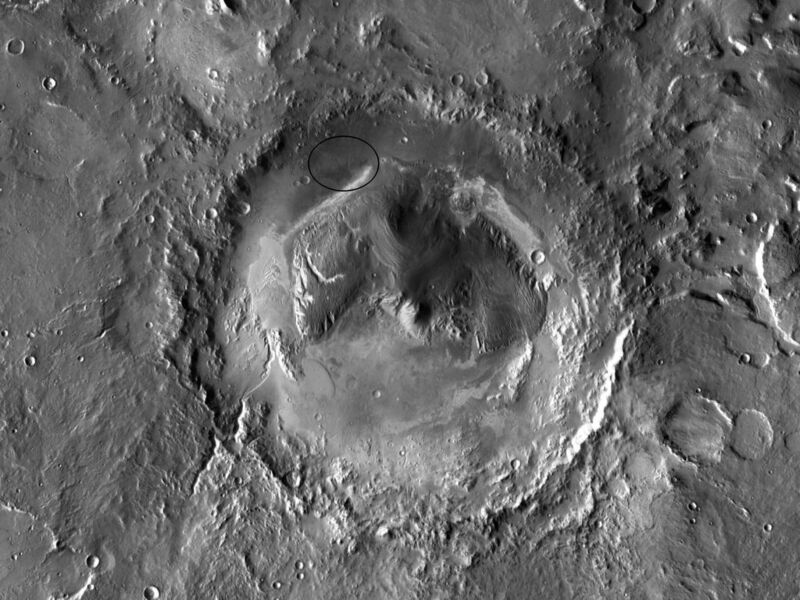 The mission's rover will be placed on the ground in a northern portion of the crater in August 2012. 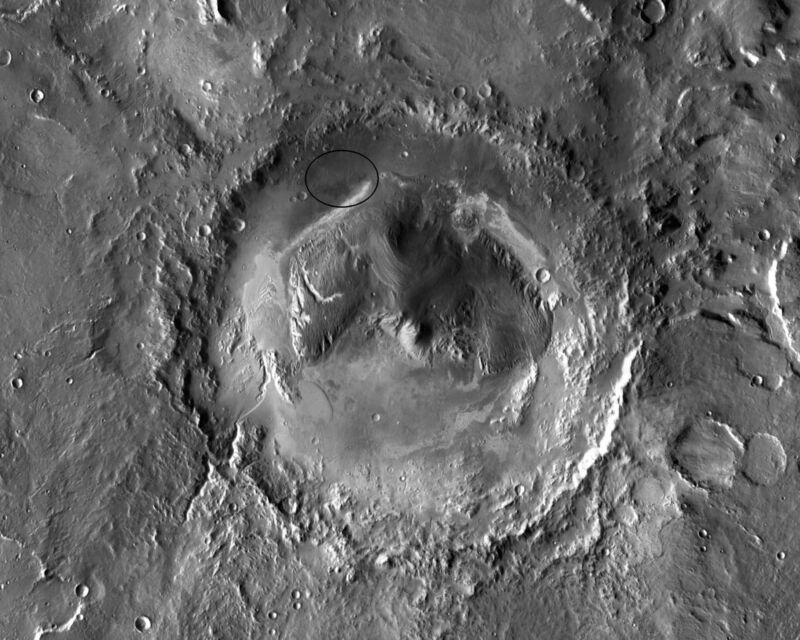 This view of Gale is a mosaic of observations made in the visible-light portion of the spectrum by the Thermal Emission Imaging System camera on NASA's Mars Odyssey orbiter. Gale crater is 96 miles (154 kilometers) in diameter and holds a layered mountain rising about 3 miles (5 kilometers) above the crater floor. The ellipse superimposed in this image indicates the intended landing area, 12.4 miles (20 kilometers) by 15.5 miles (25 kilometers). The portion of the crater within the landing area has an alluvial fan likely formed by water-carried sediments. 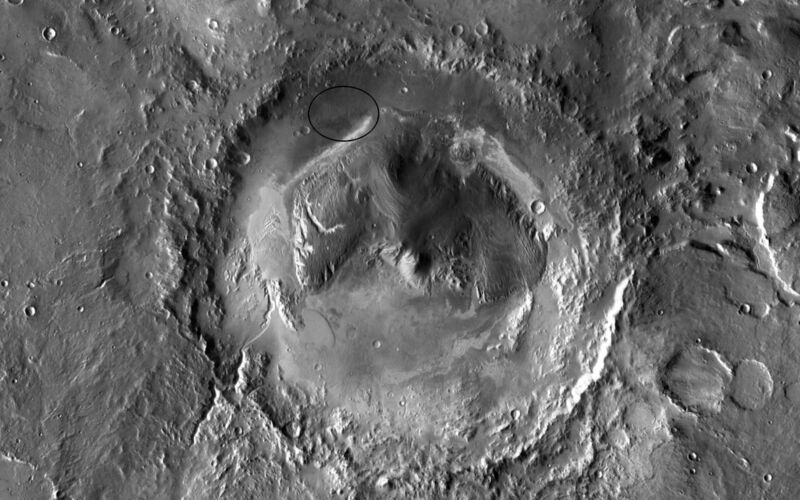 The lower layers of the nearby mountain -- within driving distance for Curiosity -- contain minerals indicating a wet history. The intended landing site is at 4.5 degrees south latitude, 137.4 degrees east longitude. NASA's Jet Propulsion Laboratory, a division of the California Institute of Technology in Pasadena, manages the Mars Science Laboratory Project and Mars Odyssey for NASA's Science Mission Directorate in Washington. Arizona State University, Tempe, operates the Thermal Emission Imaging System.